Note: In 1988, Aegis was the first company to publicly state using estimated thermal Specific Absorption Rate (SAR) measurements as the criteria for determining safe radiation exposure levels was wrong, and it is still wrong. Aegis is the only manufacturer of RF shielding products proven to protect against RF frequencies between 5 Hz. to 30 GHz., 120 GHz., 360 GHz. and up to 1.1 THz. from penetrating the body. No other organization possesses our technology and logic dictates there cannot be a more effective method of mitigating the health effects of RF frequencies than by preventing the frequencies from penetrating the body in the first place. AegisGuard™ Radiation Shield tests measure RF frequency levels for extended periods of time to determine their shielding effectiveness. The following example uses the sun to present a simplified explanation about how SAR safety standards for cell phones were created, and why they should not be used as the safety criteria for wireless product and network radiation. As you review the following information, it should be recognized that none of the health effects which have been attributed to wireless radiation are thermally induced, and it also applies to all wireless products and networks. You plan going to the beach on a hot, humid, sunny day and want to know beforehand if it is safe to do so. You contact the government public safety health agency in your area for advice and they tell you there is insufficient scientific basis for concluding exposure to the sun is safe or poses a risk to millions of people, and although current safety standards do not suggest there is a risk to your health, further study is required and there are no recommendations available for the amount of time you can safely spend in the hot sun. You attempt to research current safety standards and are provided with a web site link (no longer available) to locate additional information after being advised the standards are theoretical and were initially developed in a study conducted by a United States Military Research Laboratory in 1986, and last modified on June 14, 1997. This is how the SAR safety standards used and recommended by the United States Federal Communications Commission (FCC), the Food and Drug Administration (FDA) and regulatory agencies worldwide for determining safe levels of cell phone radiation and the radiation emitted by other products were created. You can download the study in pdf format (5.8 MB) by clicking here and review all 11 chapters of technical information, or concentrate on Chapter 10 to learn how the current SAR safe thermal standards were determined. The estimated "safe thermal level" references were derived by reviewing various studies that measured the rectal temperature of a healthy 28 year old male exposed to a sunny, hot, humid environment for 61 minutes. using an estimated rectal temperature threshold" of 39.2o C. (102.5o F.) as the basis for calculating estimated safe maximum SAR for various body organs. The study included multiple disclaimers stating the results will be different for a person of a different size, age, weight, or general health condition, and this has since been confirmed, particularly for children. It should be noted the standards do not apply to frequencies below 100 MHz., and reports concerning the health effects of frequencies beginning as low as 5 Hz. are reported regularly since 2000. This "estimated maximum temperature threshold" was then used to calculate the "estimated safe absorption rates" for individual body organs at a specific frequency lower than what is used by cellular phones, 70 MHz. Here too, the study includes a disclaimer, stating "this assumption would be expected to be valid for RF R at frequencies up to the postresonance region (perhaps up to about 1 GHz. for the average man), but might not be valid at higher frequencies." During February, 2000, the FDA said "There is currently insufficient scientific basis for concluding either that wireless communication technologies are safe or that they pose a risk to millions of users." But a report published by Microwave News in February 2003, and numerous reports since then, confirming otherwise. Click here for additional information about SAR and cellular phones. The chart shown below was developed by the United States Environmental Protection Agency (EPA) and further demonstrates the deficiencies of SAR standards. Cellular phones and other wireless products operate at microwave frequencies and there have been scientific studies published and news articles written about the health risks associated with the near field, non-ionizing radiation emitted by these products since 1993. Despite overwhelming evidence confirming SAR thermal (heating) standards should not be used to determine cell phone safety, it continues to be endorsed by regulatory agencies worldwide. 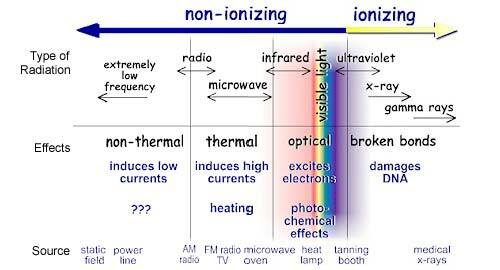 In recent years, reports and studies confirming health risks far below the thermal level (non-thermal) have been published and as indicated in the chart, there are still those who believe the effects are either unknown or questionable. AegisGuard™ radiation shielding technology was initially developed in-house during 1988 because the radiation safety standards that existed at that time were wrong, and they are still wrong. AegisGuard™ LL, LP and LS Radiation Shields are tested within a broad range of radiation frequencies from 5 Hz. to 30, 120, 360 GHz, or 1.1 THz. with power levels up to 25 Watts measured as the point of contact of a shielded surface using the most current test standards and procedures available, or at customer locations when standards are unavailable. See Tests for additional information.